Here Is Great Offer On Mobikwik Where Users Can Complete KYC To Upgrade Your Mobikwik Wallet And Get A Flat Rs. 50 Cashback. Offer Valid From 31st May To 2nd June,2016 Only. Read And Follow Below Mention Steps To Avail Mobikwik Wallet Upgradation Offer. 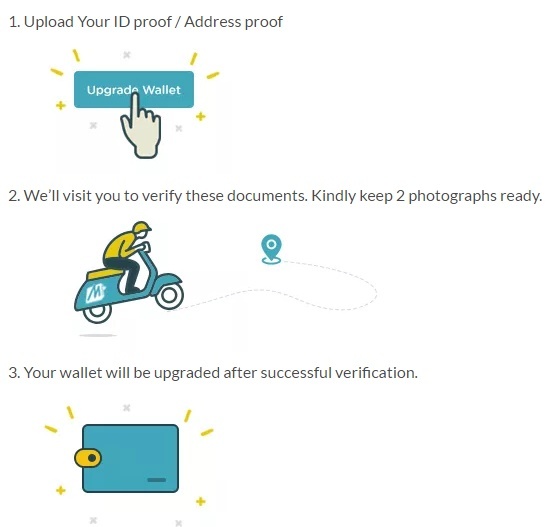 Complete your KYC to upgrade your wallet and get a flat Rs. 50 cashback. Request for KYC must be placed between 31st May and 2nd June,2016 to avail the offer. KYC must be successfully completed between 1st June and 9th June,2016 to avail the offer. Want to make a single transaction of more than Rs. 50,000? Upload your Pan Card details too! We have exclusive offers in store for users who upgrade their wallets. 4. Upload Your Photo,ID Proof,Address Proof. 6. Complete your KYC to upgrade your wallet and get a flat Rs. 50 cashback.